Osmosis (/ɒzˈmoʊ.sɪs/) is the spontaneous net movement of solvent molecules through a selectively permeable membrane into a region of higher solute concentration, in the direction that tends to equalize the solute concentrations on the two sides. It may also be used to describe a physical process in which any solvent moves across a selectively permeable membrane (permeable to the solvent, but not the solute) separating two solutions of different concentrations. Osmosis can be made to do work. Osmotic pressure is defined as the external pressure required to be applied so that there is no net movement of solvent across the membrane. Osmotic pressure is a colligative property, meaning that the osmotic pressure depends on the molar concentration of the solute but not on its identity. Osmosis is a vital process in biological systems, as biological membranes are semipermeable. In general, these membranes are impermeable to large and polar molecules, such as ions, proteins, and polysaccharides, while being permeable to non-polar or hydrophobic molecules like lipids as well as to small molecules like oxygen, carbon dioxide, nitrogen, and nitric oxide. 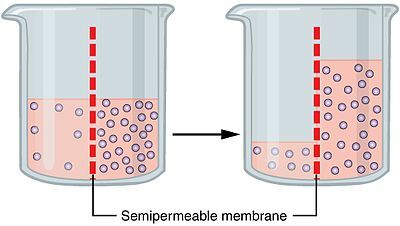 Permeability depends on solubility, charge, or chemistry, as well as solute size. Water molecules travel through the plasma membrane, tonoplast membrane (vacuole) or protoplast by diffusing across the phospholipid bilayer via aquaporins (small transmembrane proteins similar to those responsible for facilitated diffusion and ion channels). Osmosis provides the primary means by which water is transported into and out of cells. The turgor pressure of a cell is largely maintained by osmosis across the cell membrane between the cell interior and its relatively hypotonic environment. The "endosmometer" invented by Dutrochet. Some kinds of osmotic flow have been observed since ancient times, e.g., on the construction of Egyptian pyramids. Jean-Antoine Nollet first documented observation of osmosis in 1748. The word "osmosis" descends from the words "endosmose" and "exosmose", which were coined by French physician René Joachim Henri Dutrochet (1776–1847) from the Greek words ἔνδον (éndon "within"), ἔξω (éxō "outer, external"), and ὠσμός (ōsmós "push, impulsion"). In 1867, Moritz Traube invented highly selective precipitation membranes, advancing the art and technique of measurement of osmotic flow. Osmosis is the movement of a solvent across a semipermeable membrane toward a higher concentration of solute (lower concentration of solvent). In biological systems, the solvent is typically water, but osmosis can occur in other liquids, supercritical liquids, and even gases. It is hard to describe osmosis without a mechanical or thermodynamic explanation, but essentially there is an interaction between the solute and water that counteracts the pressure that otherwise free solute molecules would exert. One fact to take note of is that heat from the surroundings is able to be converted into mechanical energy (water rising). Many thermodynamic explanations go into the concept of chemical potential and how the function of the water on the solution side differs from that of pure water due to the higher pressure and the presence of the solute counteracting such that the chemical potential remains unchanged. The virial theorem demonstrates that attraction between the molecules (water and solute) reduces the pressure, and thus the pressure exerted by water molecules on each other in solution is less than in pure water, allowing pure water to "force" the solution until the pressure reaches equilibrium. As mentioned before, osmosis may be opposed by increasing the pressure in the region of high solute concentration with respect to that in the low solute concentration region. The force per unit area, or pressure, required to prevent the passage of water (or any other high-liquidity solution) through a selectively permeable membrane and into a solution of greater concentration is equivalent to the osmotic pressure of the solution, or turgor. Osmotic pressure is a colligative property, meaning that the property depends on the concentration of the solute, but not on its content or chemical identity. Osmosis may be used directly to achieve separation of water from a solution containing unwanted solutes. A "draw" solution of higher osmotic pressure than the feed solution is used to induce a net flow of water through a semi-permeable membrane, such that the feed solution becomes concentrated as the draw solution becomes dilute. The diluted draw solution may then be used directly (as with an ingestible solute like glucose), or sent to a secondary separation process for the removal of the draw solute. This secondary separation can be more efficient than a reverse osmosis process would be alone, depending on the draw solute used and the feedwater treated. Forward osmosis is an area of ongoing research, focusing on applications in desalination, water purification, water treatment, food processing, and other areas of study. ^ "osmosis Meaning in the Cambridge English Dictionary". dictionary.cambridge.org. ^ Haynie, Donald T. (2001). Biological Thermodynamics. Cambridge: Cambridge University Press. pp. 130–136. ISBN 978-0-521-79549-4. ^ Waugh, A.; Grant, A. (2007). Anatomy and Physiology in Health and Illness. Edinburgh: Elsevier. pp. 25–26. ISBN 978-0-443-10101-4. ^ "Statkraft to build the world's first prototype osmotic power plant". Statkraft. 2007-10-03. Archived from the original on 2009-02-27. ^ a b Hammel, H.T. ; Scholander, P.F. (1976). Perspectives on the Mechanism of Osmosis and Imbibition In: Osmosis and tensile solvent. Springer-Verlag, Berlin, Heidelberg, New York. link. ^ L’Abbé Nollet (June 1748) "Recherches sur les causes du bouillonnement des liquides" (Researches on the causes of the boiling of liquids) Mémoires de Mathématique et de Physique, tirés des registres de l’Académie Royale des Sciences de l’année 1748, pp. 57–104; especially pp. 101–103. The Mémoires (1748) were printed in: Histoire de l’Académie Royale des Sciences Année 1748, which was published in 1752 and which contains a condensed version of Nollet's article on pages 10–19. The etymology of the word "osmosis" is discussed in: Homer W. Smith (1960). "I. Theory of Solutions: A knowledge of the laws of solutions" (PDF). Circulation. 21 (5): 808–817 (810). doi:10.1161/01.CIR.21.5.808. ^ Kramer, Eric; David Myers (2013). "Osmosis is not driven by water dilution". Trends in Plant Science. 18 (4): 195–197. doi:10.1016/j.tplants.2012.12.001. ^ Kramer, Eric; David Myers (2012). "Five popular misconceptions of osmosis". American Journal of Physics. 80 (694): 694–699. Bibcode:2012AmJPh..80..694K. doi:10.1119/1.4722325. ^ Kosinski, R. J.; C. K. Morlok (2008). "Challenging misconceptions about osmosis". Association for Biology Laboratory Education. 30: 63–87. ^ a b Borg, Frank (2003). "What is osmosis? Explanation and understanding of a physical phenomenon". arXiv:physics/0305011.